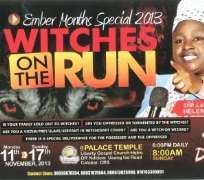 Nigeria's notorious witch hunter, 'Lady Apostle' Helen Ukpabio is at it again. She has just announced a witch finding and witch delivering session tagged “Ember Months Special 2013”. The program is taking place this month (November 11-17, 2013) at the headquarters of the Liberty Gospel Church in Calabar, Cross River State, Nigeria. The theme of the event is 'Witches on the Run”. Ukpabio is inviting people to come for "free deliverance". She qualified the deliverance as free just to create the impression that she won't be charging any fee, and she would not generate income from it! The poster has an image of a cat at the background. A cat is locally believed to be a witch's familiar in the region. The image of this familiar invokes fears and fantasies of impending danger or misfortune in the minds of the local population. Ukpabio claims to be an ex-witch with a divine mandate and power to exorcize the spirit of witchcraft. She made witchcraft deliverance the primary mission of her Liberty Gospel Church. This time, her goal is to exploit popular fears- of accidents and deaths- often entertained by Nigerians during the 'ember months' using witchcraft images and imaginaries. At this event Ukpabio will instigate witchcraft insinuations and suspicion, incite hatred and violence against children and other vulnerable members of the population often scape-goated as witches. She will spread the meme and sham of witchcraft deliverance. Deliverance may be free as advertised by Ukpabio. But the process can lead to death or permanent health damage of the person being delivered. More disturbing is that Ukpabio's witch hunting mission is set to erode the gains made so far by state and non-state actors in combating witchcraft related abuse in the region. Witch hunting will not end in Africa as long as witchcraft entrepreneurs like Ukpabio continue to act with impunity and the authorities refuse to bring them to justice. In Cameroon, the government has ordered the closure of around 100 Pentecostal churches following the death of a 9-year old girl in a local church. The girl reportedly collapsed and died during a prayer session to cast out the 'numerous demons' that controlled the girl's life. I urge the government of Cross River to take action against the witch hunting activities of Helen Ukpabio. The Nigerian government should act now to stop this notorious woman from re-infecting the region with her virus of witch belief and deliverance.